Finally I am back and in the mood to get some hobby stuff done. I have been pretty low hobby wise, hardly able to motivate myself to play, let alone paint and assemble some minis. The reason behind this is partially and mostly due to my working situation. I have had some problems with my last place of employment, which has been draining me dry the past half a year, killing off any motivation I have to do hobby stuff and a few other personal matters. Now I have settled in my new job and am plenty well motivated to get back into the hobby scene! What does this amount to, you may wonder? Check out the title of this post! I decided to take a short break from Malifaux, due to the fact that playing has been kind of lame as of late and I am really not in the mood to paint up some Gremlins. I need some fresh air and am also in the mod to try some new games. So this falls down to two games I am interested in: Dreadball and Infinity. Infinity is something I have posted here myself quite a while, but have never really finished or worked on in-depth. Mostly the reason I am just unhappy with my JSA color schemes after a while. Looking at the models just doesn’t satisfy me the way they should. Infinity initially caught my interest when they first released the Tohaa, an alien race that looked so badass, I had to start playing. I picked up the models and got rather overwhelmed by their detail and my painting skills and also patience wasn’t really sufficient enough to handle that task. So I tossed them aside for some Haqqislam and then later switched entirely to the JSA. I decided to go back to my roots and attempt to get into Infinity with the models that initially inspired me to play the game in the first place. One mistake I made, while pursuing the JSA path, was to stockpile near every model in the range for that sectorial. This basically leaves me with 30+ models sitting around, waiting for an awesome paint job. (A task I surely will pursue when I am able to…). With the Tohaa, I will handle it a bit differently. 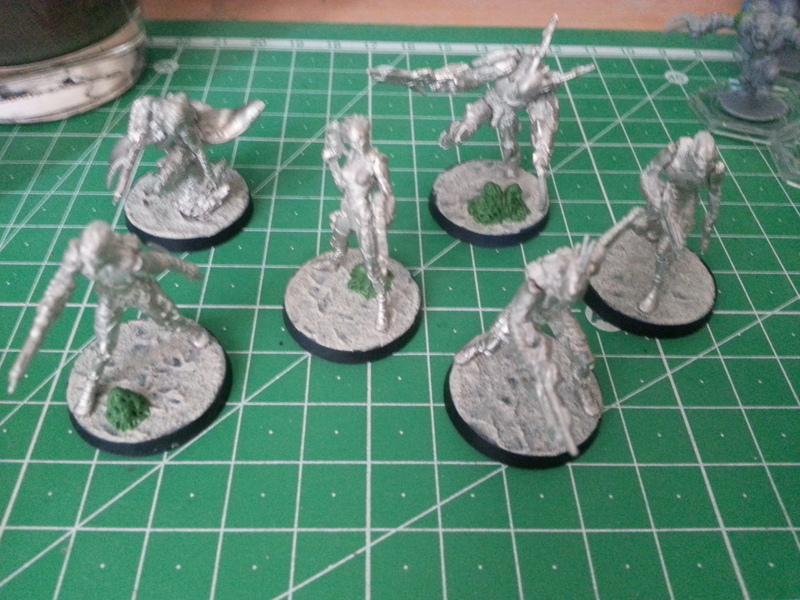 At the moment all I have lying around are the six models from the starting box. As seen in the photo above, I have already assembled them (I primed them as well, but do not have a photo of them all together primed.). I added some funky plant/stone-like additions to the sandy bases to add a foreign, alien feel to it. I really dig the bases and of course the models. I am psyched to get started on this project! The other project, as you can take from the title of this post, deals with the futuristic sports game called Dreadball. I had purchased the game a while ago as well as some models and even had a few test games with a friend. We really enjoyed it but then it kind of started to fall flat, when I entered that job-based slump sometime last year. Now I have rekindled my interest in that game and have prepped and primed my starting team. I will go into more depth on my Dreadball team, in a separate post, once I have finished painting up some of the models. The key to these projects is that they are all small scaled at the moment and not overwhelming me with many models that gnaw and nag at me from behind, waiting and annoying me to get finished. A small-scale project that should be manageable. Once these two projects are finished, I will reward myself by purchasing a few more new Tohaa models, add some more Dreadball minis (Yes, I have a lot of those lying around as well…) and toss in a couple Malifaux related projects to move forward with my “main” game. I have a few things planned, lots more to manage and am hoping to move onward with little steps and not overwhelm myself with too many projects to handle at once. So stay tuned and soon I will be posting images of the Dreadball project and its progress. Cheers! ← Four more, more four! Once you start painting them thought, they fly by pretty well! Indeed. It was too much for me to handle at the time. I believe once I have finished my Dreadball team, I should be back up to speed enough to handle it. There are so many cool miniatures out there is so easy to end up with a lead mountain, but it’s great to see some progress made and reported through the medium of blogging.